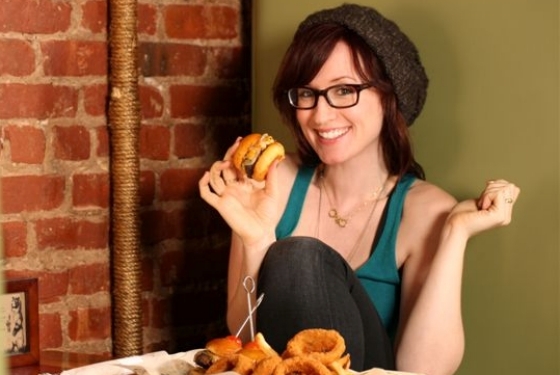 INGRID MICHAELSON’S 2011 HOLIDAY HOP! “I want to kill you in the backyard and bury you in snow,” Ingrid Michaelson sang over an upbeat piano freestyle on stage. “This is a holiday song, right?” she asked the audience at her fifth annual Christmas concert (or as she calls it, the “holiday hop”) in New York City last weekend. “It’s got the word ‘snow’ it is so … there you go! That’s all you need!” she rationalized. “I like to think all these horrible songs are going to be on Grey’s Anatomy or something,” she continued when the freestyle was over, teasing the television show whose soundtrack has unofficially dubbed her its go-to featured musician. The fact that she is featured on shows like Grey’s, however, has given Ingrid a visibility that many singer/songwriters can only dream of. Her music has been used to accompany various mediums – whether film, TV dramas, reality shows or commercials – and her star doesn’t seem to be dimming at all. Last year, she was even invited to perform her holiday duet with Sara Bareilles, “Winter Song,” at the White House’s National Christmas Tree lighting. Not bad for a ukulele-strumming girl from Staten Island, right? Opening the Holiday Hop this year was … well, Ingrid Michaelson. Concealing her natural long and voluptuous auburn hair under a short silver wig, she came on stage with her equally disguised band and backup singers as part of an Italian Staten Island caroling choir. Together, they sang holiday standards with lyrics made over to be about food and gave holiday twists to some 2011 chart-toppers (i.e. the Maroon 5/Christina Aguilera parody, “Moves Like Santa”). That’s one thing you can always expect from an Ingrid Michaelson concert: unabashed humor. For a lyricist whose songs are often rather melancholy in tone, Ingrid without fail manages to inject each of her shows with a degree of humor that few musicians are capable of doing – making her one of the most pleasurable, memorable and relatable artists to see live. If these songs are any indication of what Human Again will sound like, Ingrid may be following in the footsteps of friend Sara Bareilles and should prepare to be the Billboard chart’s favorite new “indie” girl. After all, her last album (2009’s Everybody) debuted at #18 on the U.S. charts – a testament to the power of her fans (especially considering that she hasn’t had a mainstream crossover radio hit – yet). “You guys just screamed like Justin Bieber fans!” Ingrid laughed to the crowd, which was literally roaring with delight upon hearing the opening notes to her song, “Parachute.” She has such die-hard fans, in fact, that this year’s Holiday Hop sold out entirely from an exclusive presale provided to people on Ingrid’s virtual mailing list. Plans to release the tickets a few days later to the general public had to be scrapped because there were none left. Embracing the quirky and festive nature of the evening, Ingrid alternated her set list between tracks from her previous releases and covers of songs that define the holiday season for her. In between fan-favorites like “You And I,” “Maybe,” “The Way I Am” and “Soldier,” she played “Sally’s Song” from The Nightmare Before Christmas and an upbeat rock medley of holiday tunes like “White Christmas,” “Rudolph The Red Nosed Reindeer,” “The Dreidl Song” and “Jingle Bells.” She closed with a traditional hymn, “In The Bleak Mid-Winter” – which also happened to be written by Ingrid’s father and was performed as a surprise early Christmas gift to him (awww). Then of course there was her cover of “Have Yourself A Merry Little Christmas,” the song she sings every year before leaving the stage prior to her encore. Originated by Judy Garland in the film Meet Me In St. Louis, Ingrid has always called the song her favorite. “I have such a love for her,” Ingrid said to me of Garland when I interviewed her a couple of years back. Her cover of the song was just released for purchase on iTunes last week and as part of an exclusive digital holiday EP in her official web store. For the last five years, I’ve attended each Holiday Hop that Ingrid has put on. There’s just something about seeing one of your favorite musicians decked out in green and red (and glittery golden stilettos that her “podiatrist would not be happy about”), tossing Christmas candy from the keys of her piano to her audience. It’s something that has become a quintessential part of my celebration of the holidays each year. When I left the venue, I immediately craved hot apple cider. I wanted to watch Elf and write holiday cards and wrap gifts. I wanted to go ice-skating, take a stroll through the Union Square holiday market and go check out the window displays at Saks Fifth Avenue and the Rockefeller Christmas tree. I was so annoyingly festive that even I wanted to murder me in the backyard and bury me in snow. So as it is every year, Ingrid Michaelson’s Holiday Hop was not just a terrific concert to attend. It was also the best possible way I could think of to kick off this holiday season. See you at the Holiday Hop in 2012! “Human Again” is available for pre-order on iTunes and from Ingrid’s official web store now. This entry was posted in Christmas, Grey's Anatomy, Ingrid Michaelson, Judy Garland, Sara Bareilles by Alex Nagorski. Bookmark the permalink.